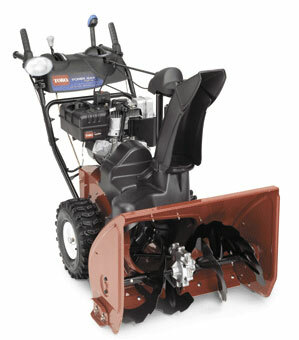 Questions on the Toro 1028LXE Snowblower? with innovative features and legendary Toro quality. which allows the operator to easily adjust the chute rotation and deflection angle with one simple control. an expanded chute base and a non-stick surface designed to minimize snow build-up. and returns snow that is not immediately thrown back into the auger, virtually eliminating clogging. including the "stuff" at the end of the driveway. A breakthrough in snowthrowing technology, the Toro Power Max auger system handles more snow in less time to get the job done fast! This revolutionary system meters snow intake. Snow that's not immdediately thrown, is returned back into the auger, providing maximum impeller speed and snowthrowing velocity. The expanded chute base with its inverted, funnel shaped design has a larger opening and a non-stick surface to minimize snow build up. Electric start - standard providing quick start on the coldest days. PowerMax™ auger system - handles more snow in less time. or adjust chute without stopping the snowthrower. withstand extreme stress, virtually eliminating the need for troublesome shear pins. and Toro Snowblower Accessories in Stock.